This week we are practicing yoga backbends. Specifically we will be working up to a backbend called Camel Pose with lots of modifications and options. 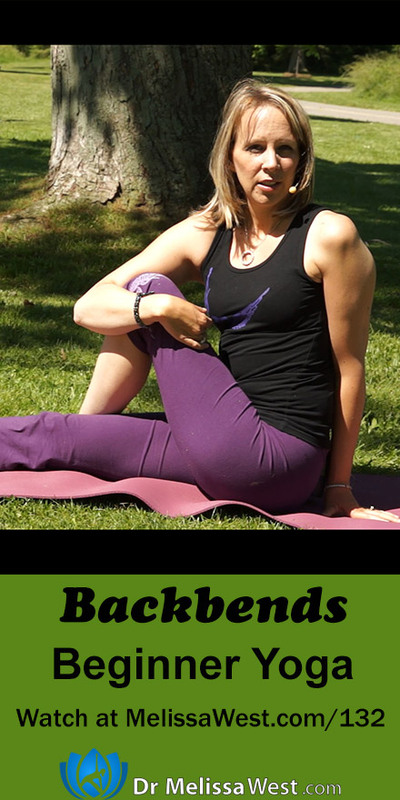 To get there we will practice lots of side-bends and twists to limber up our spine and prepare it to bend backwards. We will also be opening up the fronts of our hips to prepare our bodies for our peak pose, Camel. Camel opens your heart and your throat, two areas that we humans quite naturally like to keep protected. Opening these areas requires a willingness to surrender to vulnerability. To do that we will root deeply into the stability of the ground. Props needed 1 block. Thank you for leaving your comments on Youtube and Rating us on Itunes. Thank you for making us Canada’s Most Popular Free One Hour Online Yoga Show! Today’s question to answer in the comments is: How are you going to be open without being passive? This section of the membership site will introduce one yoga posture at a time. Each posture will cover: Benefits, Contraindications, Props, Modifications, Static/Vinyasa, Supportive Connective Tissue Practices, Brain Yoga and Crossing Over Patterns, Drishti Through the Koshas, Annamaya Kosha (your Physical body), Pranamaya Kosha (your Breath and energy Body), Manomaya Kosha (your Emotional and feeling body), Vijnanamaya Kosha (your Thought body), Anandamaya Kosha (your Spirit body), Ayurvedic Connection, Traditional Chinese Medicine Connection, Deity/God/Goddess, Chakras, Moon Phase, and Quotes from Yoga Sutras and Bhagavad Gita.